The New School Montessori holds a charter from the Ohio State Board of Education and is accredited by the Independent Schools Association of the Central States (ISACS). In addition, we have the distinction of being the only Montessori school in Cincinnati accredited by the American Montessori Society (AMS). Accreditation is a rigorous process that allows us greater autonomy, provides recognition and encourages accountability. Becoming, and remaining, an accredited school by ISACS and AMS is a difficult task. ISACS accreditation provides for our independence from blanket-type legislation that hinders many other schools. This means our program has the opportunity to design a curriculum that allows us to best meet the needs of our children, on an individual basis. 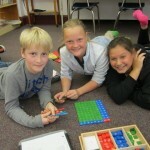 As an example, The New School Montessori conducts standardized testing only once per year. 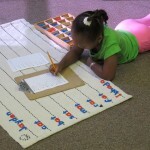 Public Montessori schools in Cincinnati are testing throughout the year. A quality Montessori school is successful in meeting this standard when it commits to a shared mission, vision, and direction as outlined in a Strategic Plan. The school establishes expectations for student learning aligned with the school’s vision and in keeping with the Montessori philosophy that is supported by school personnel and external stakeholders. These expectations serve as the focus for assessing student development and school effectiveness. The school’s vision guides allocations of time, human, material, and fiscal resources. A quality Montessori school is successful in meeting this standard when its leadership advocates for the school’s mission and vision and implements a collaborative and ongoing process for improvement that aligns the functions of the school with the expectations for student learning. Improvement efforts are sustained and the school demonstrates progress in improving its educational programs and services and school effectiveness. New improvement efforts are informed by the results of earlier efforts through reflection and assessment of the improvement process. A quality Montessori school is successful in meeting this standard when it implements a Montessori curriculum based on clear and measurable expectations for student learning that provides opportunities for all students to acquire requisite knowledge, skills, and attitudes. Teachers use proven instructional practices that actively engage students in the learning process and students exhibit a joy in learning. Teachers provide opportunities for students to apply their knowledge and skills to real world situations. A quality Montessori school is successful in meeting this standard when it uses a comprehensive assessment system based on clearly defined outcome measures. The system is used to assess student outcomes on expectations for student learning, to evaluate the effectiveness of curriculum and instruction, and determine interventions to improve student learning. The assessment system yields timely and accurate information, both qualitative and quantitative, that is meaningful and useful to students, school leaders, teachers, and other stakeholders in understanding learner outcomes, school effectiveness, and the results of improvement efforts. A quality Montessori school is successful in meeting this standard when it clearly states and adheres to roles and responsibilities expected of all employees and employs qualified personnel. The school states and follows fair and ethical employment practices for all employees. A quality Montessori school is successful in meeting this standard when its facilities and equipment are well-maintained and function to meet optimum health and safety standards conducive to a safe learning environment. A quality Montessori school is successful in meeting this standard when it has sufficient fiscal resources and practices to meet its mission and vision. The school ensures compliance with applicable federal, state, and local regulations. The quality Montessori school is successful in meeting this standard when it has sufficient human, physical, and fiscal resources and support systems to implement a Montessori curriculum that enables students to achieve expectations for student learning and addresses special needs. The school employs and allocates staff that is well-qualified for their assignments. The school provides ongoing learning opportunities for all staff to improve their effectiveness. The school ensures compliance with applicable federal, state, and local regulations. A quality Montessori school is successful in meeting this standard when it has the understanding, commitment, and support of stakeholders. School personnel seek opportunities for collaboration and partnership with stakeholders to help students learn and advance improvement efforts.